Great news on the book release. 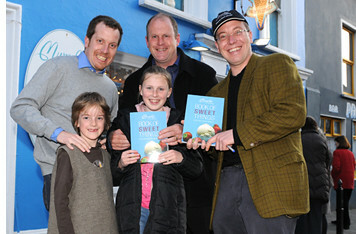 We will pick up a copy on our next trip to Dingle. We visited your shop three times on our last vacation in October. Your staff were simply a delight to talk to, and they really know their (or your) ice cream. Hope your champagne buzz has left you by now. Do you have a champagne flavor? If so, why not serve it in a chilled champagne flute. Just a thought. See you soon, if you run into Maggie from Emlagh Lodge, give her a hug from us. ah man the very best of luck with the book……I’m sure it;s gonna be a big hit! Congrats on the book! It looks beautiful!